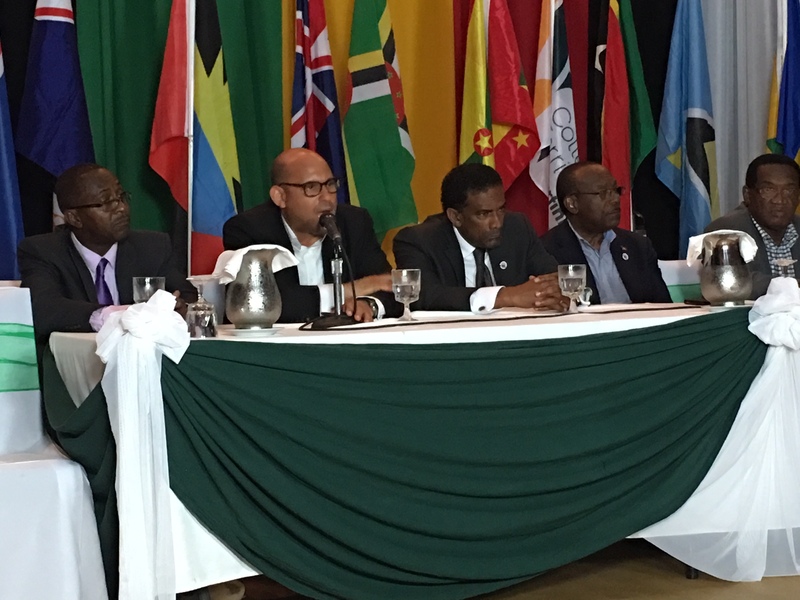 The OECS 5th Council of Ministers of Environment and Sustainability (COMES5) Meeting concluded on the evening of Wednesday, July 11 with Ministers of Environment identifying several areas for greater collaboration and unified action, to address a number of climate change issues affecting the region. Speaking at a press briefing following the conclusion of the Ministerial meeting on Wednesday, incoming Council Chair, the Hon. Minister of Agriculture and the Environment for Montserrat David Osborne gave his commitment to continue the dialogue and work with the Ministers of Environment from across the region, to find solutions to challenges, such as the invasion of the sargassum seaweed. Minister Osborne stated that the prevalence of the sargassum seaweed in the region is a critical situation right now and it formed a major part of the discussions. He acknowledged that Montserrat had not been as severely impacted as some of the other islands; but said it’s a matter which needs urgent attention. Another major topic of deliberation during the meeting, as pointed out by Minister Osborne, is the need for prompt and proper aid to be provided to disaster stricken islands. As Chair of the Council, Minister Osborne is expected to coordinate the implementation of the recommendations coming out of the meeting over the course of the year. Outgoing Chair, Grenada’s Minister for Climate Resilience, the Environment, Forestry, Fisheries and Disaster Management, the Honourable Simon Stiell in his remarks, said during the meeting significant effort was placed at looking at what took place in last year’s hurricane season and the impact it had on member states. Minister Stiell also shared his views on the need for collective approach to climate change. The COMES5 Meeting was held under the theme ‘Building Resilience on the Frontlines of Climate Change’.